On Saturday morning, some seven hours before the No. 3-ranked University of Virginia men’s basketball team was set to tip off against No. 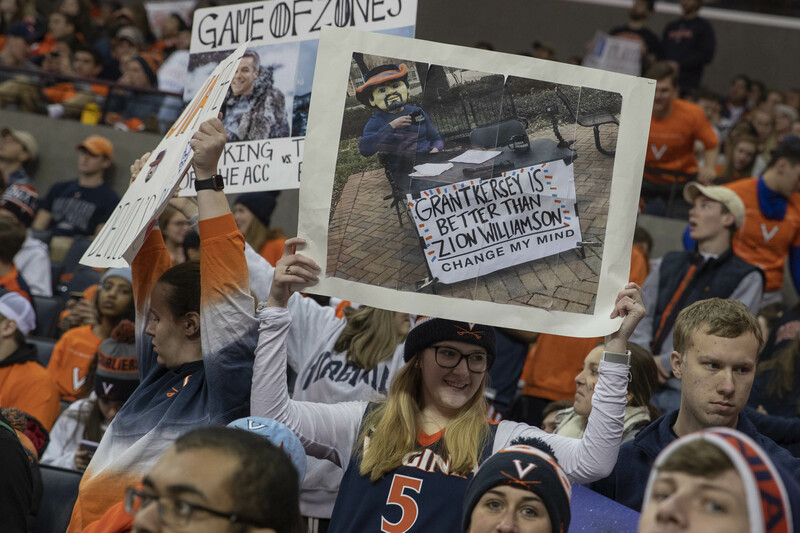 2 Duke, thousands of UVA diehards gathered at John Paul Jones Arena as ESPN’s popular “College GameDay” pre-game show returned to Charlottesville for the fourth time in the last five years. As usual, they came bearing signs. “Your signs are unbelievable!” GameDay host Rece Davis told the jam-packed student section during a commercial break. 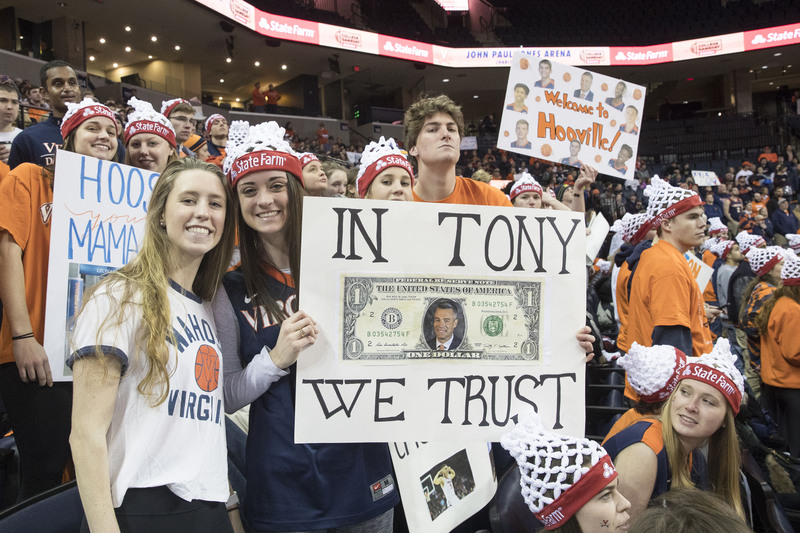 There were signs paying homage to Virginia coach Tony Bennett in extremely creative ways. 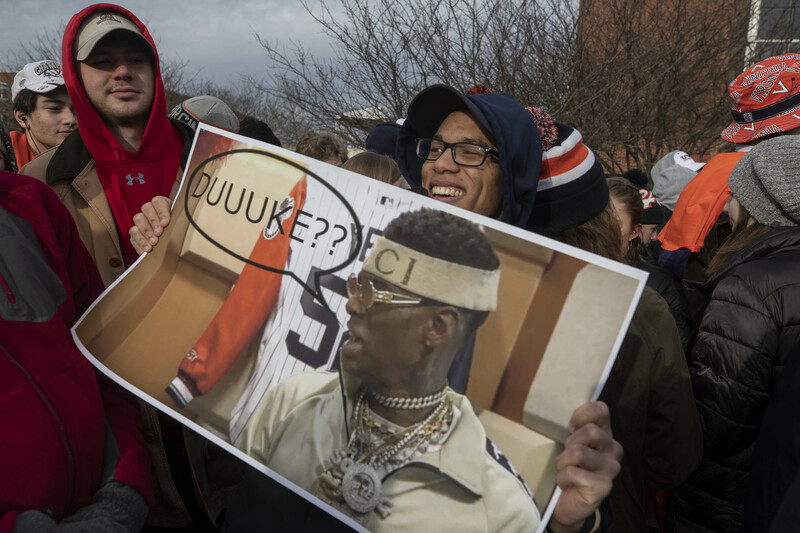 Signs extoling the many virtues of Cavalier guard Kyle Guy (who was in attendance). Signs playing up the fact that UVA is a UNESCO World Heritage Site (while pointing out Duke is not). 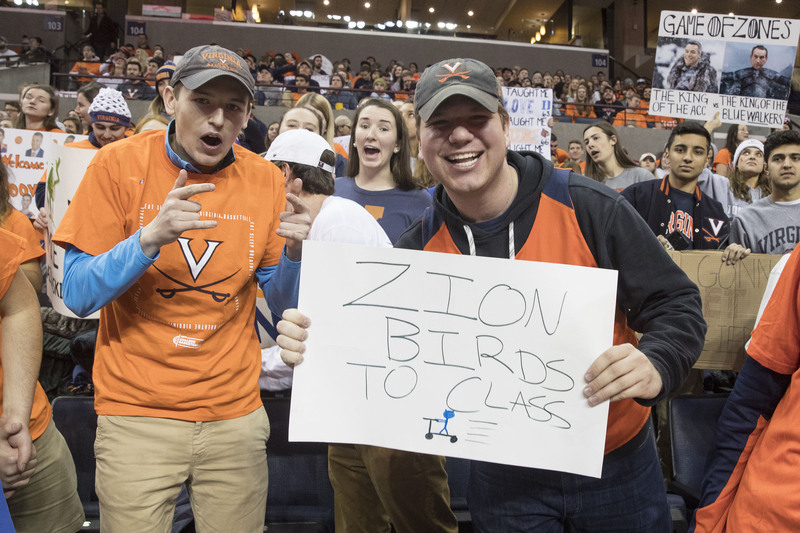 At the heart of every sign was one common denominator: a passion for all things UVA. 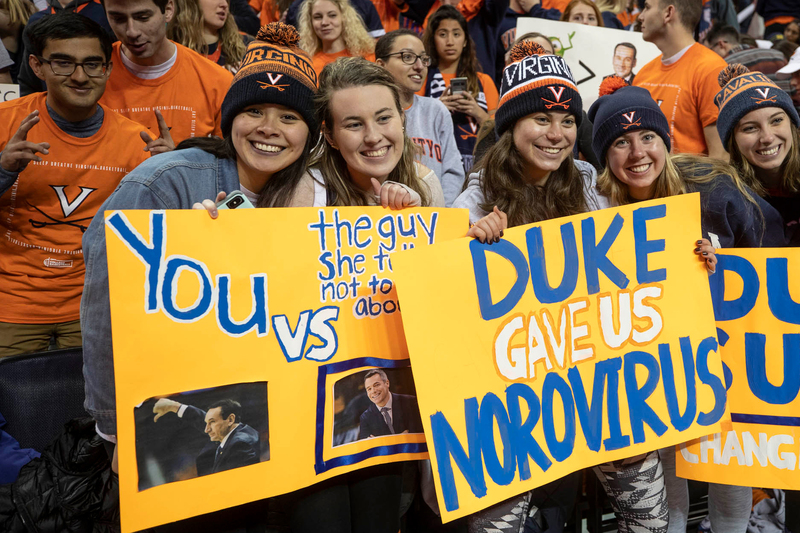 That passion was on display when Gabriel Simmons, a second-year from Yorktown, Virginia, became the fourth straight UVA student to make a half-court shot and win $19,000. 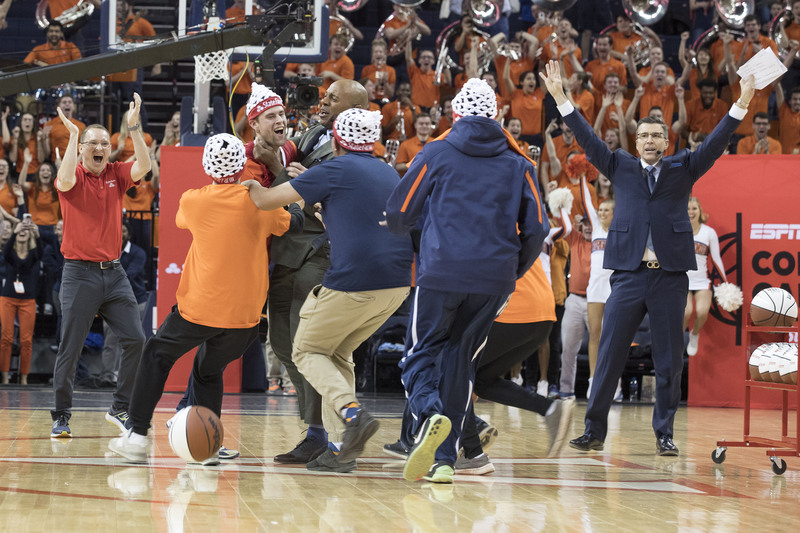 Given 19 seconds in the State Farm contest, the computer science major defied the odds and swished the shot on his fourth attempt as the JPJ crowd went bonkers. But back to those signs. The context: Most people (no matter how much they bleed orange and blue) would agree that the words “Zion” and “weak” don’t have any business in the same sentence. Duke’s best player, expected to be the No. 1 pick in the upcoming NBA Draft, looks like he could bench press a monster truck. 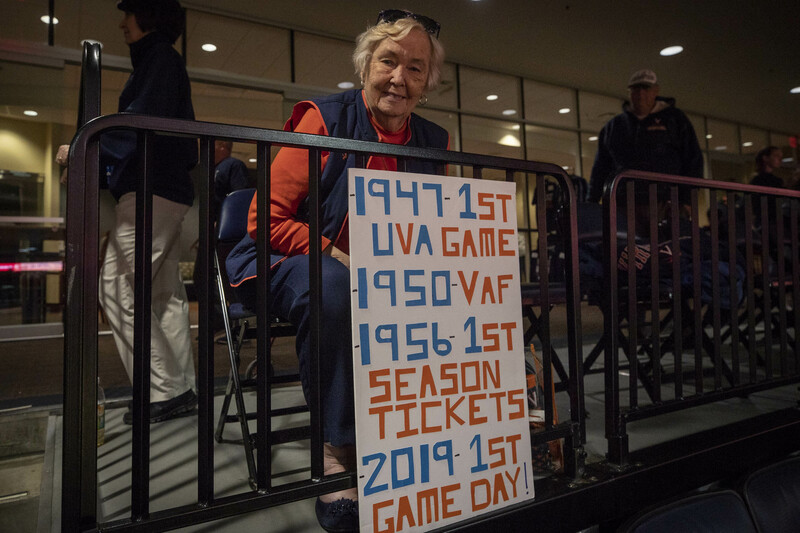 The sign: “1947-1st UVA GAME. 1950-VAF. 1956-1ST SEASON TICKETS. 2019-1st GAMEDAY! The context: Thelma Stratton Cameron, who will be 94 in March, said her daughter helped make the sign. Thelma said she has been driving to UVA basketball and football games from her home in Winchester since 1956! 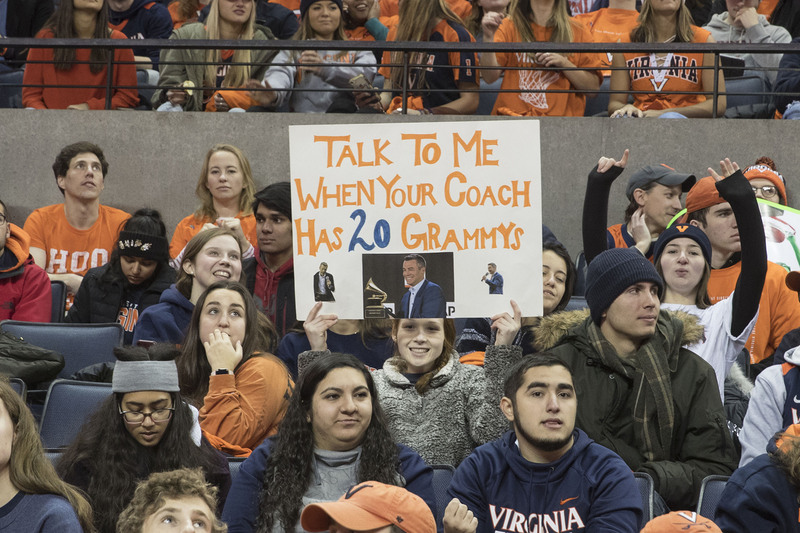 The context: A play on the fact that Virginia coach Tony Bennett just happens to share the same name as the legendary singer. The context: The UVA player – who graduated from Albemarle High School in Charlottesville – is a walk-on. He has gained folklore status after a number of impressive plays at the end of blow-out games. The context: A nasty virus made its way across Grounds recently. It didn’t really come from Duke though. Probably. The context: Bird electric scooters have been popping up all over since hitting the marketplace two years ago. The context: Pretty self-explanatory. Tony Bennett has led the ’Hoos to eight ACC regular-season championships and a 239-87 record in his 10 seasons at Virginia in establishing himself as one of the greatest coaches in the sport.